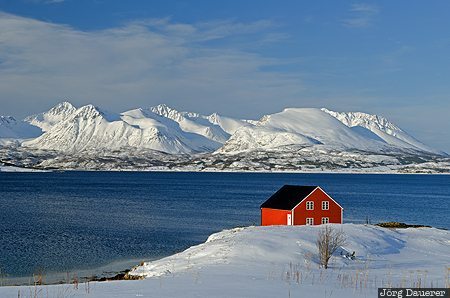 A typical red Rorbuer hut near Harstad with the snow covered mountains of the island Hinnøya in the background behind the Norwegian Sea. The island Hinnøya is part of the Vesterålen archipelago, Troms, Norway. This photo was taken in the afternoon of a sunny day in March of 2013. This photo was taken with a digital camera.